Seattle's standout linebacker has two years remaining on his contract. Seahawks middle linebacker Bobby Wagner reiterated a stance he has voiced often Wednesday, that in an ideal world he will finish his career in Seattle. But Wagner also said he’ll be watching to see how the Seahawks handle things with his fellow veteran linebacker, K.J. Wright, who has just one year remaining on his contract with no signs of an extension imminent. Wagner has two years remaining on a four-year, $43 million deal he signed in the summer of 2015 that makes him still the second-highest paid middle linebacker in the NFL behind only Carolina’s Luke Kuechly, and a year from now will also be entering the final year of his deal, a time when given his status as one of the team’s most important players, he will likely be hoping for an extension — or likely, hoping it would be done even sooner than training camp. But while Wagner said Wednesday it’s not something yet on his mind, there could be more than just money at play when the time comes to decide his NFL future. Wright is entering the final season of a four-year, $27 million deal signed late in the 2014 season. 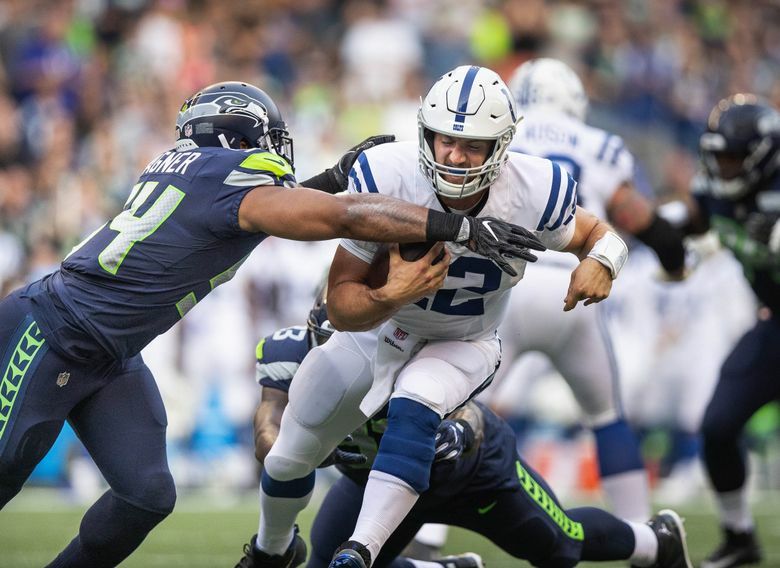 Wright, though, will turn 30 next July and the team has appeared to set something of a potential succession plan at the weakside linebacker spot by moving heralded rookie Shaquem Griffin to that position after drafting him in the fifth round in April. Griffin has worked as Wright’s backup since becoming a Seahawk. Wright was drafted in 2011 and has paired with Wagner to form what many have considered one of the best linebacking duos in the NFL since Wagner was drafted in the second round in 2012. Wright has indicated several times that he has had no discussions with the Seahawks about a possible extension. Wagner said “it would be telling’’ if the Seahawks let Wright get away and noted that he did not hold out this year. Thomas, who is also entering the final year of his contract, has not taken part in any activity with the team, with his holdout appearing likely to last into the regular season. “You definitely have to appreciate guys like K.J. because he has been here, he hasn’t missed a practice, been available and he’s letting that play out,’’ Wagner said. “But there is also a side to that if you don’t get the deal done, you give a guy like that an opportunity to walk away. “As a team you have to figure out what you want to do and who do you want to pay and that comes from the guys upstairs. But when you have certain situations where you’ve got guys that hold out but you’ve got guys that stay and do all the right things and is a leader in the room and a guy that everybody looks up to, you can’t let a guy like that walk away, and so I think for me if you let a guy like that walk away it would be telling. Wagner, though, also defended Thomas, saying that he thinks players — especially those on defense — have the right to do what they feel is necessary to get paid what they think they are worth, saying that he thinks changes in NFL rules seem to more often favor offensive players at the risk of devaluing defensive players. “It’s an interesting thing, man,’’ Wagner said. “You want him to be here, I want him to be here. But at the same time, too, there’s a business side of this thing and you know sometimes that takes over what you should be doing, and I think you see it a lot right now from the defensive side. You have amazing players that are not getting paid (the Rams’ Aaron Donald and Oakland’s Khalil Mack are also holding out) or not getting their money. At some point you have to make a stand. “Every year they are making the game harder and harder for a defensive player to play. We’ve got this new helmet rule that they don’t even know how to officiate right now and we are doing our best to adjust and I just think that defensive players are just as important as offensive players. If you don’t have a defense this league don’t exist. The Seahawks are not thought to be negotiating with Thomas, who has now missed two preseason games as well as 17 official practices. Thomas can be fined $40,000 for every missed practice, which combined with an $84,435 fine for missing mandatory minicamp in the spring and the ability of the team to take 25 percent of his $1.9 million signing bonus means the total he could be fined is approaching $1.5 million. He also will lose $500,000 for every game he misses in the regular season.